24V. Clearance Light Lenses - Choice! 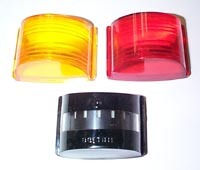 Your Choice of 3 different Clearance or Side Marker Light Lenses. Blackout, P/N: 7525992, NSN: 6220-752-5992. Solid Amber, P/N: MS35421-1, NSN: 6220-00-299-7425. Solid Red, P/N: MS35421-2, NSN: 6220-00-2997426. Location: MV-1.